Ensuring that all people, including residents, workers, and tourists can easily find their way around is a key part of making cities liveable. With so many pedestrians around, increasing accessibility encourages people to explore new places – shops, restaurants, and businesses as they pass by. Generally, introducing a network of predictable tactile signs gives pedestrians with impaired vision the confidence that they’ll be able to locate their exact position throughout their journey and arrive safely at their destination without compromising on their independence and dignity. Grade 2 Braille or contracted Braille – Where there is a series of short forms or signs to help condense long Braille words. For instance, a name like Canada could be written as C A N and then there’s a sign for ADA. Contracted Braille is much quicker to read and takes up less space than uncontracted Braille, which makes it easier to include Braille words in limited spaces. ADA signs comprise Braille dots and raised characters (tactile text) and pictograms (pictorial symbols). Although Braille is the most efficient way of communicating by touch, some visually impaired people, particularly those whose impairment developed later in life, may have never learned Braille. As such, these people require other tactile features in order to read a sign. There are raised character specifications for size, font, case, character and line spacing. The specifications for pictograms address field height, contrast and finish, and text descriptors that must be placed directly below the pictogram field. Many of the pictograms used in ADA signs contain the international symbols of accessibility (ISA), assistive listening systems, volume control telephones, and access for hearing. In addition to having Braille and tactile characters, ADA Braille signs may also contain visual (non-raised) symbols and characters such as directional arrows. Though they are not mandated, visual characters and symbol can provide additional information on the sign and are not translated in Braille. They have their own specifications for font, case, style, size, character proportion, and line spacing. 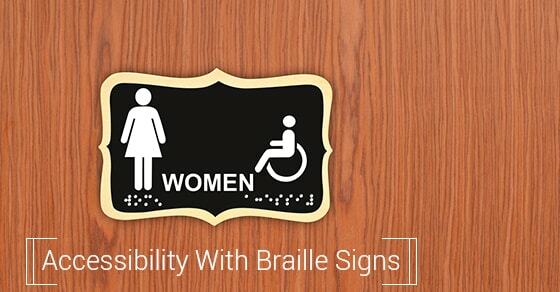 Although the combination of grade 2 Braille, tactile characters and pictograms, and visual characters and symbols in a Braille sign may seem unimaginative, working with the right signs company can add a dose of creativity to make your signs not only more accessible, but also fun and practical.